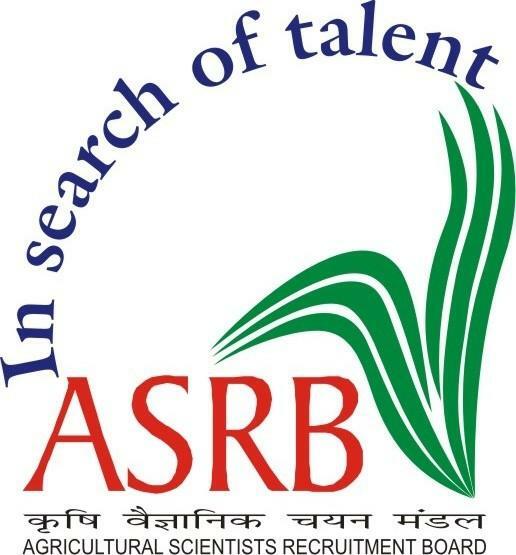 Agricultural Scientists Recruitment Board ASRB Recruitment 2017. Agricultural Scientists Recruitment Board ASRBhas been Published Recruitment Notification for below Mentioned Post. Other details like Age Limit, Educational Qualification, Selection Process and how to Apply are given below. Professional Efficiency : A typing speed of 35 w.p.m. in English or 30 w.p.m. in Hindi on computer. (35 w.p.m. and 30 w.p.m. correspond to 10500 Key Depression Per Hour on an average of 5 key depressions for each word). Interested and eligible candidates can apply before 25/9/2017. Selection Will be Based on Written Exam & Skill Test by the Agricultural Scientists Recruitment Board ASRB norms or decision. A candidate seeking admission to the Examination must apply online in the prescribed Application Form available on the website: http://www.asrb.org.in. Important instructions to the candidates for filling online applications are given in Appendix-I. The candidates are not required to attach copy of any of the documents /certificates in support of their candidature at the time of submission of online application. The candidates who qualify the Examination as per prescribed standards and qualify for Skill Test call, will be required to submit the self-attested copies of the documents/certificates in support of their candidature along with the print-out of the online application form when called for Skill Test, failing which the candidate will not be allowed to appear in the Skill test. Mere issue of admit card for the examination should not be considered that the candidate is eligible for the post in all respects. Eligibility of a candidate is checked only after qualifying the skill test. Hence, a candidate should satisfy himself / herself about his / her eligibility for the post at the time of online registration.No request for change in any field i.e., Center of Examination, Name, Father’s Name, Date of Birth, Gender, E-mail Id, Mobile No., Phone No., Category, Medium of Examination etc. except bonafide spelling/typing mistakes, will be considered under any circumstances after the time allowed for editing of an application is over. Candidates are therefore advised to be very careful while filling up their application forms.